Music Unites welcomes Music Unites Emerson, Music Unites New York University, Music Unites Northwestern, Music Unites New School, Music Unites Penn State, Music Unites Harvard, Music Unites Columbia and Music Unites CSU Long Beach. Music Unites Campus Reps bring the mission of Music Unites alive on campuses nationwide. 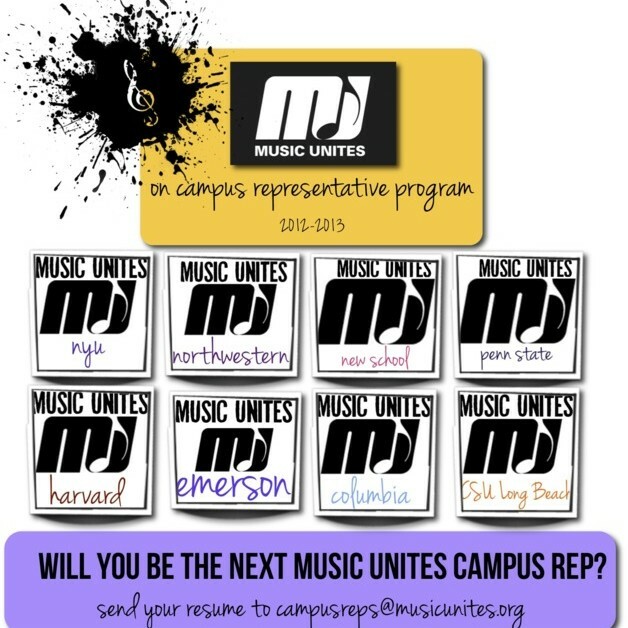 Will you be the next Music Unites Campus Rep? E-mail campusreps@musicunites.org if you are interested in inspiring the next generation of musicians on your college campus today!